With Industrial Ethernet, the Ethernet standard is used for the connection of devices in industrial production plants. Wherever conventional bus systems reach their limits, for example due to insufficient bandwidth or networking capabilities, Industrial Ethernet-based infrastructures are increasingly used. Industrial Ethernet switches are an integral part of every modern communication link, thanks to their flexibility and performance. Due to the growth of seamless digitalization of production processes, a reliable communication based on a worldwide uniform standard is essential. In the future, Industrial Ethernet will also be used as a vital communication system in vehicle technology. Industrial image processing is an essential component of the industry 4.0. Power over Ethernet allows the simultaneous transmission of data and energy via the twisted pair cable. This technology enables a seamless integration of image processing systems into industrial production systems in a flexible and cost-optimized manner. This also applies to the modernization and expansion of existing machines and industrial systems. The growing number of sensors and camera systems effectively extends the digital factory model supported by PoE. In industrial applications, interference factors affect the network and its components, which have a significant impact on reliability, transmission quality and integrity. The risk of disturbances caused by vibrations, dirt, humidity and external electromagnetic influences is particularly high at the terminals, where connectors and devices are interconnected. Robust and resistant housings, outstanding EMC performance, low emitted interference and high interference immunity characterize our products. 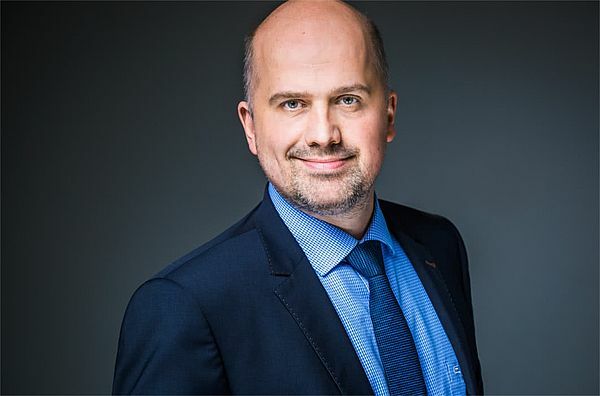 Due to the increasing digitalization of the industry, the real and the virtual world are growing together into the Industrial Internet of Things. The decentralization of the installed communication devices and the increasing information transparency through IioT-sensors in the production facilities, are required to gain the needed flexibility. By increasing the efficiency and optimizing the infrastructure, downtimes and production losses can be avoided. Our products meet these challenges and offer reliability and planning security for the industry 4.0. The integration of cross-market technologies offers innovative solutions for future requirements of the industry. 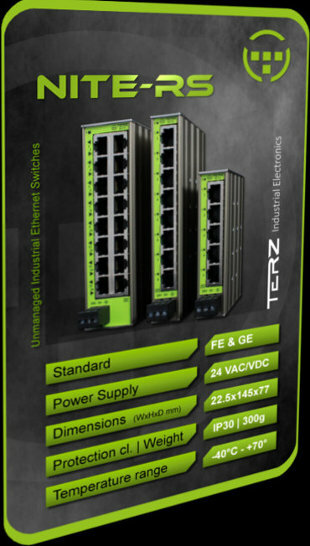 TERZ Industrial Electronics offers many years of experience in industrial networking technology. Current and future market requirements are the focus for our product development and form the basis for efficient customer solutions. 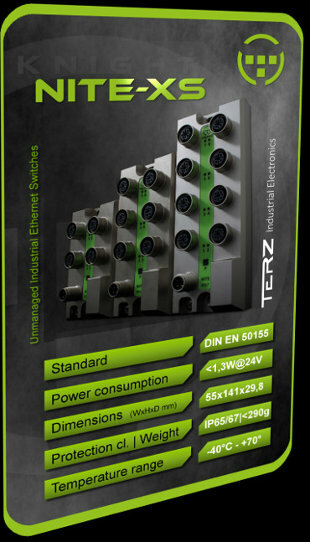 The TERZ Industrial Ethernet switches meet the technological and market-specific standards for the required industrial approvals and certifications. A consistently high quality as well as efficient procedures and processes ensure an optimal result. Our customers profit from the cross-application requirements that we place on our products. 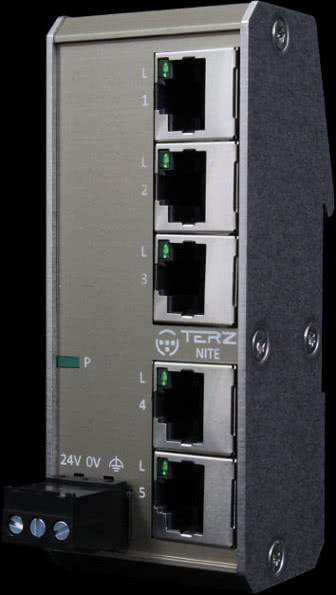 The TERZ product range includes Industrial Ethernet Switches with RJ45 and M12 connection technology and M12 Industrial USB Flash Drives. All products are designed for use in industrial automation and for use in vehicles such as passenger trains, agricultural machinery, commercial vehicles and ships. In order to make the products as efficient and reliable as possible, great attention is paid on the optimization during development. During the concept phase, the long-term availability, industrial suitability and quality of the components used are ensured. 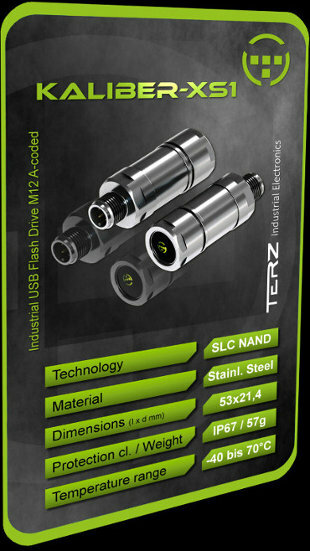 The M12 USB Flash Drives have been designed and developed for use in continuous operation and can be used in industry and railways thanks to the robust IP65/67 stainless steel housing, superior shock and vibration resistance, high dielectric strength and the extended temperature range. SLC NAND flash and over-provisioning, combined with high-performance wear-leveling and error-correction procedures (ECC), provide increased lifetime of stored data (retention) and longevity of flash memory cells (endurance). The world's most compact Industrial M12 switches are perfectly suited for use in passenger trains, buses, commercial vehicles and agricultural machinery. 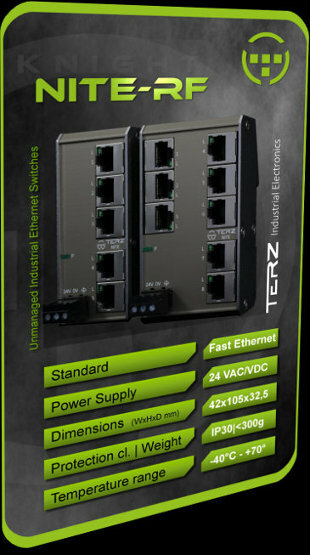 Dustproofed and protected against water jets, the TERZ Industrial Ethernet switches save valuable space in control cabinets. With excellent electrical properties (DIN EN 50121-3-2), a dielectric strength of 2.25 kVDC, high shock and vibration resistance (DIN EN 61373) and fire protection according to DIN EN 45545, the NITE-XS comply with DIN EN 50155. Thanks to the extended temperature range and two different frame forwarding / blocking variants (LLDP / PTCP), all applications are optimally supported. 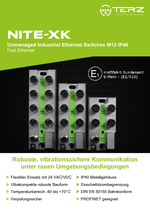 With minimum size and low power consumption, the IP40 Industrial Ethernet switches can be used in harsh industrial environments thanks to the shock and vibration-proofed M12 connection technology. The redundant 24 Volt AC/DC power supply is protected against polarity reversal and works reliably even with undersupply below 10 VDC. The tolerance to voltage dips and the limitation of the inrush current enable a stable operation in all operating conditions. 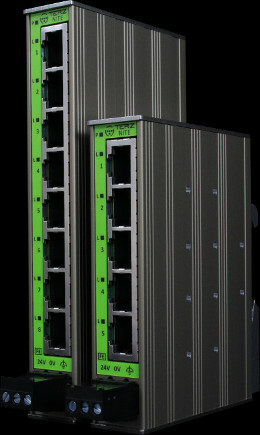 The IP40 variants also meet the requirements for use in trains according to DIN EN 50155 and are also available in two frame forwarding/blocking variants and suitable for PROFINET applications. With a width of only 22.5 mm and a mounting depth of 75 mm, the Industrial Ethernet switches impress with their extremely slim and high-quality metal housing. The highly optimized plug and play switches are energy efficient and enable an easy and fast commissioning and mounting on the DIN rail. Designed specifically for industrial and IoT applications, the switches support priority-controlled packet forwarding (Quality of Service) for maximum data communication efficiency. The 24 VAC/VDC power supply with reverse polarity protection and inrush current limiting and the extended temperature range from -40°C to +70°C and a dielectric strength of 2.25 kVDC guarantee safe and reliable operation. The NITE-RS switches require the world's smallest installation space in control cabinets including the power connector. 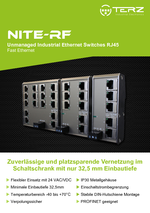 With an installation depth of only 32.5 mm and a height of 105 mm, the Industrial Ethernet switches impress with their extremely flat and high-quality aluminium housing. The ultra-compact switches can be used in any control cabinet thanks to the 24 VAC/VDC power supply with inrush current limiting and reverse polarity protection. Due to the reduced footprint and the arrangement of all connections on the front, switch cabinets and cabling can be optimized to reduce the costs. 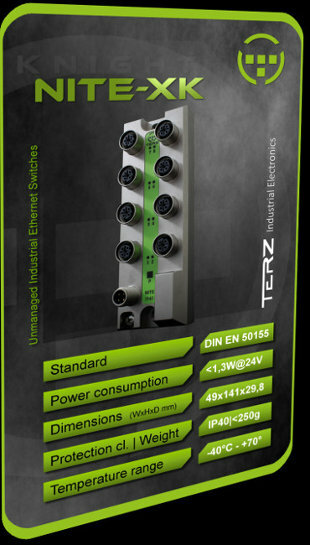 The high-quality DIN rail holder made of metal ensures a firm and secure hold on the DIN rail. 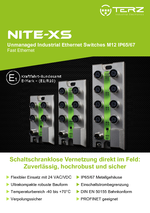 Like all TERZ Industrial Ethernet switches, the flat NITE-RF are available in two frame forwarding variants and fully suitable for PROFINET applications. 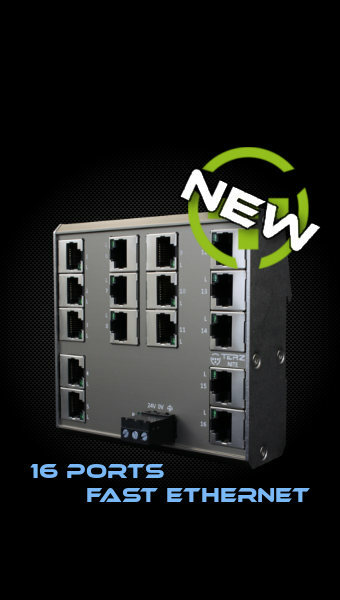 The SPARK-XS PoE switches enable the supply of up to 6 devices with power and data. By reducing the connection to just one cable and saving additional power supplies, the cost, installation effort and space requirements can be reduced. The switches operate according to the IEEE standard 802.3at Type 1 as Power Sourcing Equipment (PSE) and supply the connected devices with up to 15.4 watts per port. The retrofitting of existing applications where space is exhausted in the control cabinet, is possible as well as the construction of new installations optimized with a focus on decentralization of the components. The communication technology installed in modern rail and road vehicles used in public transport and in commercial vehicles is increasingly based on Ethernet. The central element for connecting the data network in the vehicle are Industrial Ethernet switches. 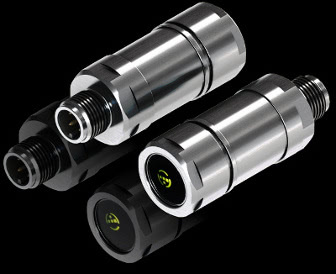 Power over Ethernet, maximum data transmission, space-saving design, approvals for use in vehicles and robust housings as well as robust connection technology are required for this application. Industrial Ethernet has been established as the uniform communication standard for automation technology up to the field level. Control-relevant data and IT data can be transmitted over the same medium at the same time. Permissible cable length and bandwidth are often higher than for classic fieldbuses. Important are a quick and easy commissioning, maximum data throughput, low space requirements and high operational reliability. Image processing systems are an important part of modern factory automation. The field of applications include quality assurance, process control and safety applications. Industrial cameras enable an increased efficiency of existing plants and machines and help to prevent production downtime and fluctuating production quality. Power over Ethernet and a high bandwidth rate are required for the efficient use of image processing systems. Please let us know your concerns, we will be happy to help you! Diese Verkaufsbedingungen (nachfolgend „AGB“) gelten ausschließlich und gegenüber Unternehmern (§ 14 BGB), juristischen Personen des öffentlichen Rechts oder öffentlich-rechtlichen Sondervermögen. Entgegenstehende oder von unseren Verkaufsbedingungen abweichende Bedingungen des Kunden erkennen wir nur an, wenn wir ausdrücklich schriftlich der Geltung zustimmen. Der Auftraggeber erkennt mit der Entgegennahme eines Angebots, einer Auftragsbestätigung, spätestens aber mit der Erteilung eines Auftrags oder der Entgegennahme einer Leistung an, dass ausschließlich diese AGB für die gesamten Geschäftsbeziehungen gelten sollen. Die einmal vereinbarten AGB gelten auch für zukünftige Vertragsabschlüsse als vereinbart. Ein Schweigen des Lieferanten auf anderslautende Bestimmungen des Bestellers ist nicht als Einverständnis mit dessen Bedingungen anzusehen; deren Geltung wird widersprochen. Jede Abweichung von den AGB des Lieferanten gilt als Ablehnung des Auftrags, eine dennoch – auch unter Vorbehalt – erfolgte Entgegennahme einer Lieferung als Einverständnis mit den AGB des Lieferanten. Diese AGB gelten auch für alle zukünftigen Geschäfte, Lieferungen, Reparaturen und sonstige Leistungen, soweit es sich um Rechtsgeschäfte verwandter Art handelt. Aufträge werden erst bei Bestätigung des Lieferanten in Textform oder Ausführung der Bestellung rechtsverbindlich. Nebenabreden, Vorbehalte, Änderungen oder Ergänzungen eines Vertrags bedürfen zu ihrer Gültigkeit der schriftlichen Bestätigung des Lieferanten, es sei denn es handelt sich um eine Individualvereinbarungen gemäß § 305b BGB. bedeutet jedweden Grund, der entweder uns oder den Lieferanten die Erfüllung der jeweiligen vertraglichen Pflichten unmöglich macht und der aus Umständen entsteht, die außerhalb der zumutbaren Kontrolle der jeweiligen Partei liegen, einschließlich aber nicht beschränkt auf Naturkatastrophen, Handlungen von Regierungen oder von supranationalen Institutionen, Ausbrüche von Gewalt, nationale Notstände, terroristische Angriffe, Aufstände, innere Unruhen, Brände, Explosionen oder Überschwemmungen. bedeutet der Besteller der Waren, der auf der Bestellung angegeben ist. sind die von uns versandten Wirtschaftsgüter. Detaillierte Darstellung der Ware mit konkreten Verwendungshinweisen. Der Auftragnehmer ist 14 Tage an sein Angebot gebunden. Anschließende Annahmen durch den Auftraggeber stellen ein neues Angebot dar und bedürfen der Annahme durch den Auftragnehmer. Weicht der Auftrag des Auftraggebers vom Kostenanschlag des Auftragnehmers ab, so kommt ein Vertrag in diesem Falle erst mit der Bestätigung des Auftragnehmers zustande. An allen in Zusammenhang mit der Auftragserteilung dem Kunden überlassenen Unterlagen, wie z. B. Kalkulationen, Zeichnungen etc., behalten wir uns Eigentums- und Urheberrechte vor. Diese Unterlagen dürfen Dritten nicht zugänglich gemacht werden, es sei denn, wir erteilen dazu dem Vertragspartner unsere Zustimmung oder es ist für die Vertragsumsetzung erforderlich. Soweit wir das Angebot des Vertragspartners nicht innerhalb der Frist von Punkt 1 annehmen, sind diese Unterlagen uns unverzüglich zurückzusenden. Der Auftraggeber hat die für die Ausführung der Leistung notwendigen Daten oder Pläne unentgeltlich und rechtzeitig, d.h. mindestens vier (4) Wochen vor Produktionsbeginn, zu übergeben. Wird die Frist versäumt und entstehen dadurch Verzögerungen, hat der Auftraggeber den hierdurch entstehenden Mehraufwand und/oder Schaden zu tragen. Die Preise gelten ausschließlich Verpackung und zuzüglich Mehrwertsteuer in jeweils gesetzlicher Höhe. Kosten der Verpackung, Porto und Zoll werden gesondert in Rechnung gestellt. Der Abzug von Skonto ist grundsätzlich ausgeschlossen. Der Kaufpreis ist innerhalb von 10 Werktagen nach Rechnungsstellung fällig. Als Zahlungstag gilt der Tag, an dem das Geld auf dem angegebenen Konto gutgeschrieben wird. Bei Zahlungsverzug gelten die gesetzlichen Regelungen. Die, laut Auftragsbestätigung mit uns vereinbarten Preise gelten nur bei Abnahme der dort vereinbarten Menge. Transport- und alle sonstigen Verpackungen nach Maßgabe der jeweils gültigen Verpackungsverordnung werden nicht zurückgenommen. Der Käufer ist verpflichtet, für eine Entsorgung der Verpackung auf eigene Kosten zu sorgen. Der Auftraggeber stellt den Auftragnehmer von den Verpflichtungen nach §§ 16 und 17 ElektroG (Rücknahmepflicht) und damit in Zusammenhang stehenden Ansprüche Dritter frei. Der Beginn der von uns angegebenen Lieferzeit setzt die rechtzeitige und ordnungsgemäße Erfüllung der Verpflichtungen des Kunden, sowie die Klärung aller technischen Fragen voraus (§ 2 Abs. 3). Die Einrede des nicht erfüllten Vertrages bleibt vorbehalten. Liefertermine und Lieferfristen werden durch uns in Textform mitgeteilt und sind erst dann verbindlich. Die Lieferfrist ist eingehalten, sofern der Liefergegenstand bis zu Ihrem Ablauf versandt worden ist. Teillieferungen sind insoweit zulässig, sofern dem Vertragspartner keine erheblichen Mehraufwände oder zusätzliche Kosten entstehen, die Lieferung der Restlieferung sichergestellt ist und die Teillieferung im Rahmen des vertraglichen Bestimmungszwecks für den Kunden verwendbar ist. Die Lieferung erfolgt „ab Werk / ex wortes“ (Incoterms 2010). Ein Versand erfolgt ausschließlich auf Rechnung und Gefahr des Kunden. Die Gefahr des zufälligen Untergangs und der zufälligen Verschlechterung der Ware geht mit der Übergabe, beim Versendungskauf mit der Auslieferung der Sache an den Spediteur, den Frachtführer oder der sonst zur Ausführung der Versendung bestimmten Person oder Anstalt auf den Kunden über. Dieses gilt auch für Teillieferungen. Gibt der Vertragspartner keinen besonderen Versandwunsch an, so versenden wir die Ware nach dem uns geeignet erscheinenden Versandweg. Festgestellte Transportschäden sind unverzüglich anzuzeigen und die Ware ist mit einer Anerkenntniserklärung der Spedition, Post, Bahn oder eines sonstigen Paketdienstes sowie einer Abtretungserklärung des Kunden an uns einzusenden. 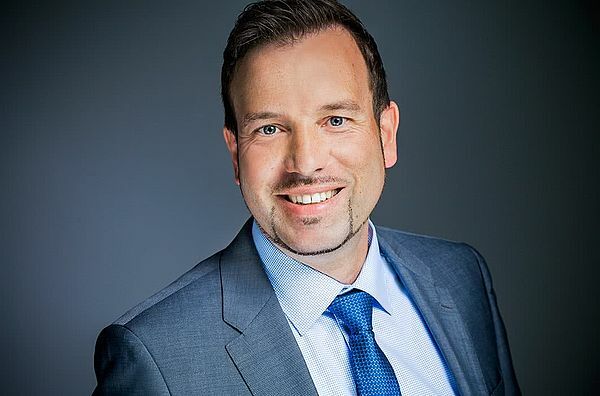 Hiernach kann eine Ersatzlieferung durch uns erfolgen, soweit die Voraussetzungen einer Anspruchsstellung des Transportunternehmens gegeben sind und der Unternehmer alle hierfür erforderlichen Unterlagen und Informationen überreicht hat. 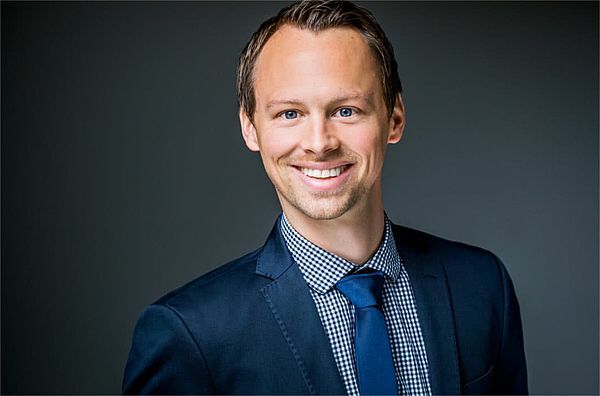 Verzögert sich der Versand infolge von Umständen die wir nicht schuldhaft zu vertreten haben, so geht die Gefahr vom Tage der dem Auftragnehmer mittgeteilten Versandbereitschaft auf diesen über. Eine Transportversicherung wird nur auf ausdrücklichen Wunsch des Kunden und nur zu seinen Lasten abgeschlossen. Wir sind nach unserer Wahl zur Nacherfüllung in Form einer Mangelbeseitigung oder Lieferung einer mangelfreien Sache berechtigt. Uns steht das Recht zu, die Nacherfüllung zwei Mal durchzuführen. Danach kann der Kunde nach seiner Wahl, Rücktritt oder Minderung nach den gesetzlichen Bestimmungen verlangen. Der Auftraggeber ist verpflichtet, Lieferungen unverzüglich zu untersuchen. Die Feststellung von Mängeln muss dem Lieferanten binnen einer Ausschlussfrist von einer Woche unter Angabe der konkreten Beanstandung in Textform gemeldet werden. Die Frist beginnt bei offenen Mängeln mit der Übergabe, bei verdeckten mit der Entdeckung. Nach Ablauf der Frist ohne eine Rüge von Mängeln sind Gewährleistungsansprüche ausgeschlossen. Die Verjährungsfrist für Gewährleistungsansprüche aus Kauf- und Werklieferverträgen beträgt ein Jahr ab Ablieferung der Ware. Die Schadenersatzansprüche des Auftraggebers wegen eines Mangels verjähren nach einem Jahr ab Ablieferung der Ware. Dies gilt nicht für Schadenersatzansprüche aus einer Garantie, der Übernahme eines Beschaffungsrisikos im Sinne von § 276 BGB, Ansprüchen wegen Verletzung von Leib, Leben oder Gesundheit, arglistigen, vorsätzlichen oder grob fahrlässigen Handelns unsererseits, oder wenn in den Fällen der §§ 478, 479 BGB (Rückgriff in der Lieferkette), § 438 Abs. 1 Nr. 2 oder soweit sonst gesetzlich eine längere Verjährungsfrist zwingend festgelegt ist. § 305b BGB (Vorrang der Individualabrede in mündlicher oder textlicher oder schriftlicher Form) bleibt unberührt. Eine Umkehr der Beweislast ist mit der vorstehenden Regelung nicht verbunden. Unsere Gewährleistung und die sich hieraus ergebende Haftung ist ausgeschlossen, soweit Mängel und damit zusammenhängende Schäden nicht nachweisbar auf fehlerhaftem Material, fehlerhafter Konstruktion, auf mangelhafte Ausführung, fehlerhaften Herstellungsstoffen oder soweit geschuldet, mangelhafter Nutzungsanleitung beruhen. Insbesondere ist die Gewährleistung und die sich hieraus ergebende Haftung aufgrund Pflichtverletzung wegen Schlechtleistung ausgeschlossen für die Folgen fehlerhafter Benutzung, ungeeigneter Lagerbedingungen, und die die Folgen chemischer, elektromagnetischer, mechanischer oder elektrolytischer Einflüsse, die nicht den in unserem Produktbeschreibungen oder einer abweichenden vereinbarten Produktspezifikation oder dem jeweils produktspezifischen Datenblatt unsererseits oder seitens des Herstellers vorgesehen, durchschnittlichen Standardeinflüssen entsprechen. Vorstehendes gilt nicht bei arglistigem, grob fahrlässigen oder vorsätzlichem Handeln unsererseits, oder Verletzung von Leib, Leben oder Gesundheit, der Übernahme einer Garantie, eines Beschaffenheitsrisikos nach § 276 BGB oder eine Haftung nach einem gesetzlich zwingenden Haftungstatbestand. Wir übernehmen keine Gewährleistung nach §§ 478, 479 BGB (Rückgriff in der Lieferkette - Lieferantenregress), wenn der Kunde die von uns vertragsgegenständlich gelieferten Produkte bearbeitet oder verarbeitete oder sonst verändert hat, soweit dies nicht den vertraglich vereinbarten Bestimmungszweck der Produkte entspricht. Die Anerkennung von Pflichtverletzungen in Form von Sachmängeln bedarf stets der Textform. § 305b BGB (Vorrang der Individualabrede) bleibt unberührt. Soweit eine Haftung für Schäden, die nicht auf der Verletzung von Leben, Körper oder Gesundheit des Käufers beruhen, und eine Fahrlässigkeit nicht ausgeschlossen ist, verjähren derartige Ansprüche innerhalb eines Jahres, beginnend mit der Entstehung des Anspruchs. Der vorgenannte Haftungsausschluss gilt ebenfalls für leicht fahrlässige Pflichtverletzungen unserer Erfüllungsgehilfen. Soweit die Schadensersatzhaftung uns gegenüber ausgeschlossen oder eingeschränkt ist, gilt dies auch im Hinblick auf die persönliche Schadensersatzhaftung unserer Angestellten, Arbeitnehmer, Mitarbeiter, Vertreter und Erfüllungsgehilfen. Stehen mehrere Forderungen gegen den Auftraggeber offen und reicht eine Zahlung des Bestellers nicht zur Tilgung sämtlicher Forderungen aus, so erfolgt die Tilgung nach den gesetzlichen Vorschriften des § 366 BGB, es sei denn der Käufer erklärt die Tilgung ausdrücklich auf eine Hauptschuld. Ein etwaiges gesetzliches Aufrechnungsrecht, Zurückbehaltungsrecht oder Leistungsverweigerungsrecht steht dem Auftraggeber nur in Ansehung unbestrittener oder rechtskräftig festgestellter Forderungen zu, die aus demselben Vertragsverhältnis stammen. Dies gilt auch für ein Zurückbehaltungsrecht nach § 369 HGB. Der Lieferant behält sich das Eigentum an den gelieferten Waren bis zur vollständigen Bezahlung der offenen Forderungen vor. Der Eigentumsvorbehalt gilt auch, bis sämtliche, auch künftige und bedingte Forderungen aus der Geschäftsverbindung, zwischen dem Auftraggeber und uns erfüllt sind. Der Auftraggeber ist zur Verarbeitung der gelieferten Ware im Rahmen seines regelmäßigen Geschäftsbetriebs berechtigt. Die Verarbeitung der Ware erfolgt für den Auftragnehmer, ohne ihn zu verpflichten; die neuen Sachen werden Eigentum des Auftragnehmers. Bei Verarbeitung mit anderen, nicht dem Auftragnehmer gehörenden Waren erwirbt der Auftragnehmer Miteigentum an der neu hergestellten Sache nach dem Verhältnis des Rechnungswertes der Vorbehaltsware zu den anderen verarbeiteten Gegenständen. Sollte das Eigentum des Auftragnehmers trotzdem untergehen und der Auftraggeber (Mit-) Eigentümer werden, so überträgt er schon jetzt auf den Auftragnehmer sein Eigentum nach dem Verhältnis des Rechnungswertes der Vorbehaltsware zu den anderen verarbeiteten Gegenständen als Sicherheit. Der Auftraggeber hat in allen genannten Fällen die im Eigentum oder Miteigentum des Auftragnehmers stehenden Sachen für diesen unentgeltlich zu verwahren. Die Veräußerungsermächtigung des Auftraggebers erlischt automatisch mit einem bei ihm durchgeführten fruchtlosen Zwangsvollstreckungsversuch, bei Protest eines vom Käufer einzulösenden Schecks oder Wechsels sowie bei Stellung eines Antrags auf Eröffnung des Insolvenzverfahrens über das Vermögen des Käufers. Im Übrigen sind andere Verfügungen über die Vorbehaltsware, insbesondere Verpfändung und Sicherungsübereignung unzulässig und führen zu einem Veräußerungsverbot. Der Auftraggeber tritt bereits jetzt an den Auftragnehmer alle aus der Weiterveräußerung der Vorbehaltsware in verarbeitetem und unverarbeitetem Zustand entstehenden Forderungen mit allen Nebenrechten ab, der diese Abtretung annimmt. Im Falle der Veräußerung von verarbeiteter, verbundener, vermischter oder vermengter Vorbehaltsware erwirbt der Lieferant den erstrangigen Teilbetrag, der dem prozentualen Anteil des Rechnungswertes seiner gelieferten Ware zzgl. eines Sicherheitsaufschlags von 5 % entspricht. Der Auftraggeber ist vorbehaltlich des jederzeit möglichen Widerrufs berechtigt, die an den Auftragnehmer abgetretenen Forderungen im regelmäßigen Geschäftsbetrieb einzuziehen. Der Auftragnehmer wird von seiner eigenen Einziehungsbefugnis keinen Gebrauch machen, solange der Käufer seinen Zahlungsverpflichtungen – auch gegenüber Dritten – vereinbarungsgemäß nachkommt. Tritt der Auftraggeber seine Anschlussforderung an ein Factoring-Institut im Rahmen eines sogenannten echten Factoring unter Übernahme des Delkredererisikos ab, tritt der Auftraggeber seine Ansprüche gegen das Factoring-Institut auf Auszahlung des Factoring-Erlöses an den Auftragnehmer ab und verpflichtet sich, dem Factoring-Institut unverzüglich nach Rechnungsstellung durch die Auftragnehmer diese Abtretung anzuzeigen. Der Käufer ist verpflichtet, dem Auftragnehmer auf Verlangen eine genaue Aufstellung der dem Auftragnehmer zustehenden Forderungen mit Namen und Anschrift der Abnehmer, Höhe der einzelnen Forderungen, Rechnungen usw., auszuhändigen und dem Auftragnehmer alle für die Geltendmachung der abgetretenen Forderungen notwendigen Auskünfte zu erteilen und die Überprüfung dieser Auskünfte zu gestatten. Der Käufer ist verpflichtet, die Ware pfleglich zu behandeln. Bei Pfändungen oder sonstigen Eingriffen Dritter hat uns der Käufer unverzüglich zu informieren. Eine sodann vorzunehmende Verarbeitung, Einbau, Verbindung oder Umbildung (§§ 946, 947, 950 BGB) der noch im Eigentum des Auftragnehmers stehenden Ware ist dem Auftraggeber nur noch mit vorheriger Zustimmung in Textform des Lieferanten gestattet. Der Auftragnehmer ist berechtigt, diese AGB - soweit sie in das Vertragsverhältnis mit dem Auftragnehmer eingeführt sind - einseitig zu ändern, soweit dies zur Beseitigung nachträglich entstehender Äquivalenzstörungen oder zur Anpassung an veränderte gesetzliche oder technische Rahmenbedingungen erforderlich ist. Hierüber wird der Auftragnehmer unter Mitteilung des Inhaltes der geänderten Regelungen informiert. Die Änderung wird Vertragsbestandteil, wenn der Auftraggeber nicht binnen sechs (6) Wochen nach Zugang der Änderungsmitteilung der Einbeziehung in das Vertragsverhältnis uns gegenüber in Textform widerspricht. Sollte eine Bestimmung dieses Vertrages aus Gründen des Rechtes der allgemeinen Geschäftsbedingungen nach §§ 305 bis 310 BGB ganz oder teilweise unwirksam/ nichtig oder nicht durchführbar sein oder werden, gelten die gesetzlichen Regelungen. Sollte eine gegenwärtige oder zukünftige Bestimmung des Vertrages aus anderen Gründen als den Bestimmungen betreffend das Recht der allgemeinen Geschäftsbedingungen nach §§ 305 bis 310 BGB ganz oder teilweise unwirksam/ nichtig oder nicht durchführbar sein oder werden, so werden hiervon die Gültigkeit der übrigen Bestimmungen dieses Vertrages nicht berührt, soweit nicht die Durchführung des Vertrages - auch unter Berücksichtigung der nachfolgenden Regelung – für eine Partei eine unzumutbare Härte darstellen würde. Das Gleiche gilt, wenn sich nach Abschluss des Vertrages eine ergänzend bedürftige Lücke ergibt. Entgegen dem Grundsatz der Rechtsprechung des Bundesgerichtshofes, wonach eine salvatorische Erhaltungsklausel grundsätzlich lediglich die Beweislast umkehren soll, soll die Wirksamkeit der übrigen Vertragsbestimmungen unter allen Umständen aufrechterhalten bleiben und damit § 139 BGB insgesamt abbedungen werden. Die Parteien werden die aus anderen Gründen nach den Bestimmungen betreffend das Recht der allgemeinen Geschäftsbedingungen nach §§ 305 bis 310 BGB unwirksamen/nichtige/undurchführbare Bestimmungen oder ausfüllungsbedürfte Lücken durch eine wirksame Bestimmung ersetzen, die in ihrem rechtlichen und wirtschaftlichen Gehalt der unwirksamen /nichtigen/ undurchführbaren Bestimmung und dem Gesamtzweck des Vertrages entspricht. § 139 BGB (Teilnichtigkeit) wird ausdrücklich ausgeschlossen. Beruht die Nichtigkeit einer Bestimmung auf einem darin festgelegten Maß der Leistung oder der Zeit (Frist oder Termin), so ist die Bestimmung mit einem dem ursprünglichen Maß am nächsten kommenden rechtlichen zulässigen Maß zu vereinbaren. Einbeziehung und Auslegung dieser Geschäftsbedingungen regeln sich ebenso wie Abschluss und Auslegung der Rechtsgeschäfte mit dem Auftraggeber selbst ausschließlich nach dem Recht der Bundesrepublik Deutschland. Die Anwendung des einheitlichen Gesetzes über den Abschluss von internationalen Verträgen über bewegliche Sachen, des einheitlichen Gesetzes über den internationalen Kauf beweglicher Sachen des UN-Kaufrechts sind ausgeschlossen. Ist der Kunde Kaufmann, juristische Person des öffentlichen Rechts oder öffentlich-rechtliches Sondervermögen, ist ausschließlicher Gerichtsstand für alle Streitigkeiten aus dem Vertragsverhältnis mit dem Kunden, einschließlich Wechsel- und Urkundenprozessen, unser Geschäftssitz. Die Betreiber dieser Seiten nehmen den Schutz Ihrer persönlichen Daten sehr ernst. Wir behandeln Ihre personenbezogenen Daten vertraulich und entsprechend der gesetzlichen Datenschutzvorschriften sowie dieser Datenschutzerklärung. Die Nutzung unserer Webseite ist in der Regel ohne Angabe personenbezogener Daten möglich. Soweit auf unseren Seiten personenbezogene Daten (beispielsweise Name, Anschrift oder E-Mail-Adressen) erhoben werden, erfolgt dies, soweit möglich, stets auf freiwilliger Basis. Diese Daten werden ohne Ihre ausdrückliche Zustimmung nicht an Dritte weitergegeben. Wir weisen darauf hin, dass die Datenübertragung im Internet (z.B. bei der Kommunikation per E-Mail) Sicherheitslücken aufweisen kann. Ein lückenloser Schutz der Daten vor dem Zugriff durch Dritte ist nicht möglich. Da durch neue Technologien und die ständige Weiterentwicklung dieser Webseite Änderungen an dieser Datenschutzerklärung vorgenommen werden können, empfehlen wir Ihnen sich die Datenschutzerklärung in regelmäßigen Abständen wieder durchzulesen. Definitionen der verwendeten Begriffe (z.B. “personenbezogene Daten” oder “Verarbeitung”) finden Sie in Art. 4 DSGVO. Die Server-Logfiles werden eine begrenzte Anzahl von Tagen gespeichert und anschließend gelöscht. Die Speicherung der Daten erfolgt aus Sicherheitsgründen, um z. B. Missbrauchsfälle aufklären zu können. Müssen Daten aus Beweisgründen aufgehoben werden, sind sie solange von der Löschung ausgenommen bis der Vorfall endgültig geklärt ist. Sie haben als Nutzer das Recht, auf Antrag eine kostenlose Auskunft darüber zu erhalten, welche personenbezogenen Daten über Sie gespeichert wurden. Sie haben außerdem das Recht auf Berichtigung falscher Daten und auf die Verarbeitungseinschränkung oder Löschung Ihrer personenbezogenen Daten. Falls zutreffend, können Sie auch Ihr Recht auf Datenportabilität geltend machen. Sollten Sie annehmen, dass Ihre Daten unrechtmäßig verarbeitet wurden, können Sie eine Beschwerde bei der zuständigen Aufsichtsbehörde einreichen. Sofern Ihr Wunsch nicht mit einer gesetzlichen Pflicht zur Aufbewahrung von Daten (z. B. Vorratsdatenspeicherung) kollidiert, haben Sie ein Anrecht auf Löschung Ihrer Daten. Von uns gespeicherte Daten werden, sollten sie für ihre Zweckbestimmung nicht mehr vonnöten sein und es keine gesetzlichen Aufbewahrungsfristen geben, gelöscht. Falls eine Löschung nicht durchgeführt werden kann, da die Daten für zulässige gesetzliche Zwecke erforderlich sind, erfolgt eine Einschränkung der Datenverarbeitung. In diesem Fall werden die Daten gesperrt und nicht für andere Zwecke verarbeitet.